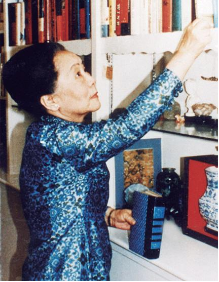 Chien-Shiung Wu was born in Jiangsu province, China on May 31, 1912 and had 2 brothers. As a part of her family custom, she and her siblings received the names Ying-Shiung-Hao-Jie, meaning "heroes and outstanding figures". Her father nurtured her academics. In elementary school, she went to a school for girls founded by her father. Once she was 11, she chose the competitive option and applied for scholarships for an elite boarding school. She ranked 9th among 10,000 applicants. These early experiences profoundly effected her. In college, she was studying math, but then transferred to physics. She immediately got into politics and her involvement in protests would be overlooked by authorities because she remained top of her class. That being the case, she was careful not to neglect her studies. Her family encouraged and her ambitions called her to pursue her Ph.D. in United States. They organized the funds, she and her friend set off on the SS President Hoover in August 1936; she was 24 years old. Her parents saw her off. She would never see them again. Robert Wilson [worked on the Manhattan Project] & George Volkoff [co-predicted the existence of neutron stars], and her friends were Ursula Schafer [German immigrant, history student] & Margaret Lewis [post doctoral student]. Wu applied for a scholarship, but there was prejudice against Asian students, and Wu took a readership with a lower stipend. Here is where she began her work on Beta Decay, testing to see the electromagnetic radiation produced by the deceleration of a charged particle when deflected by another charged particle. It was this that would lead her to discovery. Life moving fast, in 1944, Wu joined the Manhattan Project under Substitute Alloy Materials division. I’m not sure why. I think it was an opportunity to do research. She worked on an instrument that detects radiation. At the end of the war, communication with China was restored, and Wu received a letter from her family, but couldn't visit because soon-after China entered a civil war. Wu continued to investigate Beta Decay by re-verifying Enrico Fermi’s theory of Beta Decay - he explains beta decay of a neutron by direct coupling of a neutron with an electron, an antineutrino and a proton. She crafted a new experiment. She thought the OG experiment used a copper sulfate, a thick and uneven film, which caused the emitted electrons to lose energy. "She had a very, very strong sense that things had to be done right," Wu’s former graduate student, Leon Lidofsky. "If it was done sloppily, it wasn’t worth doing because the results weren’t reliable." She added detergent to the copper sulphate to produce a thin and even film. She successfully confirmed the theory then demonstrated the discrepancies observed were experimental error. This experiment defined the authority on Beta Decay. This experiment led to the discovery of parity violation - a new fact, a new truth, a discovery about the fabrics of reality. Wu had disproved a fundamental law of nature. Richard Feynman pronounced the notion of parity violation "unlikely, but possible, and a very exciting possibility," but later made a $50 bet with a friend that parity would not be violated. Two physicists came to Wu with the problem. Two sub-atomic particles, the theta meson and the tau meson shared the same mass — suggesting they might actually be two forms of the same particle. However, they decayed in two different parity states, one positive and one negative. If they were in fact the same particle, this would have to mean conservation of parity is not upheld. But how to prove it? Wu devised an experiment to test these two particles. She tested them at a weaker interaction. She showed that this is indeed the case: parity is not conserved under the weak nuclear interactions. The theta meson and the tau meson are in fact the same particle, known today as a kaon. Even though, Wu devised the experiment and disproved the law of conservation parity, the two male colleagues who presented the problem to Wu won the Nobel Prize in 1957. She was not publicly honored until 1978, when she was awarded the inaugural Wolf Prize. Later in Life, Wu added to history of Physics in other ways, but more notably, became a political activist. She protested the inhumane imprisonment happening Taiwan of relatives of physicist Kerson Huang in 1959, and of the journalist Lei Chen in 1960. She protested the crackdown in China that followed the Tiananmen Square massacre of 1989. In 1964, she spoke out against gender discrimination at the Massachusetts Institute of Technology, "I wonder, whether the tiny atoms and nuclei, or the mathematical symbols, or the DNA molecules have any preference for either masculine or feminine treatment." When colleagues referred to her as Professor Yuan, she would correct them and say she was Professor Wu. In 1975, Robert Serber, the new chairman of the Physics Department Columbia University, adjusted her pay to make it equal to that of her male counterparts. Wu's older brother died in 1958, her father in 1959 and her mother in 1962. At that time the United States government had severe restrictions on its citizens' ability to travel abroad, so she was not permitted to visit China to attend their funerals. It wasn’t until Nixon traveled in 1972 was she able to visit her brother and her uncle in 1973. I reacted to Stephen Hawking’s death in small waves of aftershocks. His passing effected my filter on daily life, dialing the contrast back significantly and approaching the day with a more mechanical, de-mystified view. I was struck but too callous to react, twinge, even squint in discomfort. But the world is undeniably wicked and cool. Its full of bugs and lava and eons, trillion years of growth and change. This is why I started this scientific history series. Universe in Reverse exists to embolden the interesting in the world. It is undeniable Science has an irresistible allure and that feel of a chase. Science as a narrative, someone discovering something for the first time, fills anyone with insatiable curiosity, especially the scientists themselves. Feynman embodied this rush, this high with his book, “The Pleasure of Finding Things Out”. Recognizing Hawking requires acknowledging his predecessors, those who were bold and willing enough to test such unholy thoughts, to do those sacrilegious experiments. It requires recognizing the unsung, brilliant particle physicist, Chien-Shiung Wu. Wanda Lough is a contributing writer based in Austin, Texas, for Human Influence.